Back in 2009, while I was still at Phaidon, I worked on a cookbook called Coco, which I’ve probably mentioned here before. It was part of the 10×10 series Phaidon publishes, whereby ten heavy hitters in their field (be it architecture, graphic design, fashion, etc.) each select ten emerging talents in that field. Coco was the first food book in that series, and the curators selecting the underlings included Ferran Adrià, Mario Batali, Alice Walters, and René Redzepi. The funny thing is, Carbone was somewhat between restaurants at the time. And to be featured in Coco, each chef needed to be currently head chef at a restaurant. Carbone was technically heading up Aeronuova, a new Italian restaurant in Terminal 5 at JFK. It was a little unusual, but my guess is he was brought on to put together their menu and do initial recipe consulting. When I was compiling the directory of restaurants I didn’t even know what address to publish: Terminal 5, JFK Airport, Queens, New York? But I knew something was up his sleeve, and Batali’s sleeve, because they seemed to suggest a new restaurant was in Carbone’s future, but it just wasn’t open yet. And sure enough, as Coco hit the bookstores, a little red-sauce joint known as Torrisi Italian Specialities opened on Mulberry Street, near Prince Street, in December 2009, serving Italian-American staples like meatball subs and eggplant parm at the counter. Carbone and his co-chef and co-owner, and former Boulud colleague, Rich Torrisi, have created a kind of post-postmodern mecca of ziti and antipasti in Little Italy. Amidst all the fading tourist-trap pasta joints and clam bars on Mott and Mulberry Street. It’s a throwback to your Italian grandma’s Sunday suppers in Queens (or New Jersey, or Long Island), gravy and all. But the ingredients are good. Really good. Not imported from Italy, but all domestic and/or made in-house, like mozzarella made to order and house-cured olives. Olive oil from California that’s so good they should serve it in a demitasse cup for dessert, sprinkled with sea salt from Coney Island. All this time I’ve been wanting to see what the buzz is about. In the meantime, Torrisi and Carbone opened Parm next door to Torrisi, a more casual restaurant serving some of the old favorites (like the subs), without the long waits and hard-to-get reservations of Torrisi, which now only serves a tasting menu or prix fixe but no more a al carte at dinner. At Torrisi we were greeted with four antipasti for the table, including the famed mozzarella, hand-pulled to order, drizzled in that delicious, fruity olive oil and crunchy sea salt. When left to rest at the table, the mozzarella became more enjoyable, softer, and more buttery, then when it was first set down. It was served with four small perfect pieces of garlic bread: saltier, crunchier, cheesier, more garlicky than you’re expecting. When our busser cleared the empty plate we both nearly lept to keep the dish so we could lick the crumbs. We stopped ourselves. As part of our antipasti, a warmed parsnip cider was served in an espresso cup with a cool apple foam on top. Raw fluke Americain provided a clean, fresh bite between all the cheese and dough. Lastly, for the antipasti, was a rustic rabbit terrine served with pickled vegetables. The pasta course, spicy sea shells di mare, was solid—the fish and shellfish were all cooked well, the pasta al dente, the sauce salty and spicy. It didn’t knock my socks off but it was darn tasty. For our main courses we were served skate giardinia and local duck with mulberry mustard. But by the time these mains came we were, well, stuffed like shells. I thought the main successes of the night were served at the bookends, our antipasti and the pastry: butternut squash custard, pizzelle cannoli, almond rainbow cookies, celery cake with green jelly and peanuts (a take on ants on a log), and a chocolate-mint truffle. The favorites were the eggplant parmesan, which really did taste like my Italian (step) grandmother used to make when I was little, the Brussels sprouts, and the cauliflower. 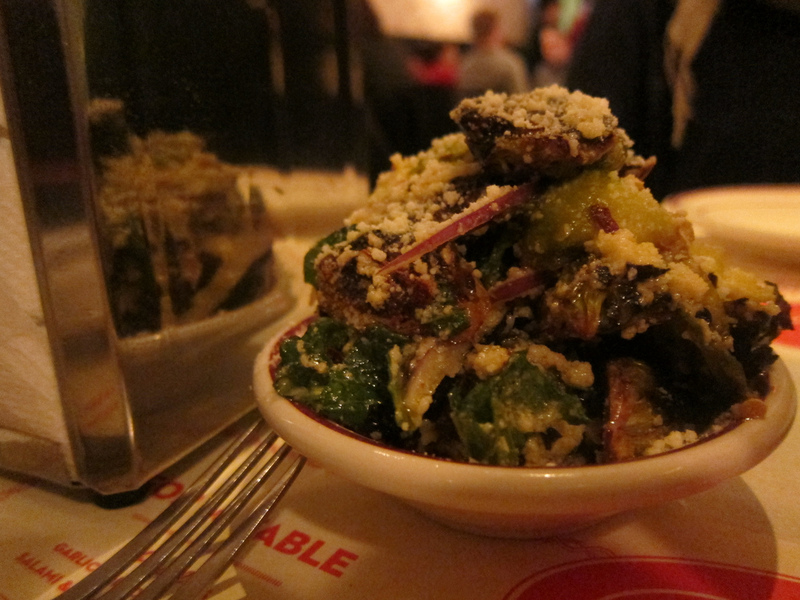 The sprouts were caramelized and served with thin crunchy slivers of red onion, parmesan, sea salt, and garlic. The cauliflower was nicely browned and seasoned and honestly tasted like candy in that way that only really good cauliflower can. Again, like my Italian grandma used to make. These guys are good. The only sore spot in the evening at Parm came with the meatballs. First off, they were served flattened, and stacked, like a double hamburger. Maybe this is typical in some nonna’s kitchens but I know them to be rounded, and sized somewhere between a golf ball and baseball. The main issue, however, was that they were not properly cooked. The meat was verging on rare, cold in the center even. Our server argued with us, saying he was sure they were cooked through and that’s how they do it here. Minus two points. 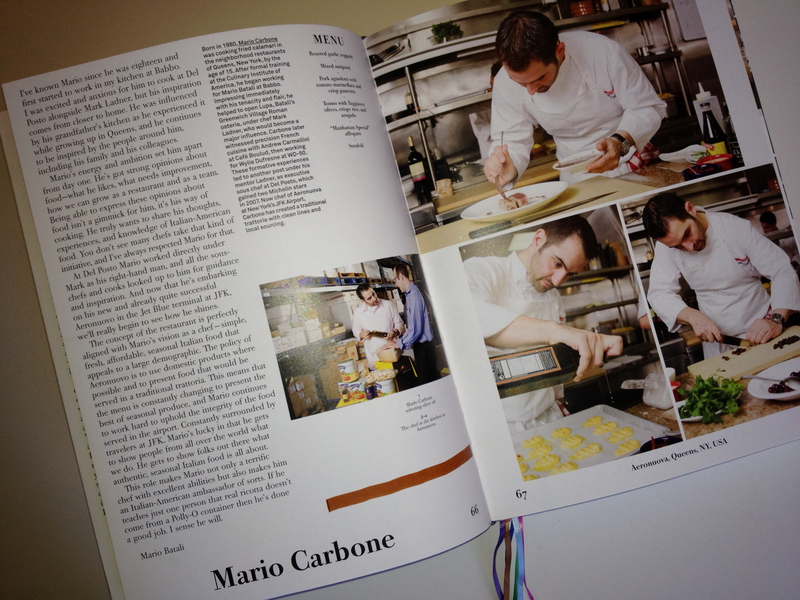 Using the four-star system of the Times, I’d give Torrisi two stars and Parm one star. 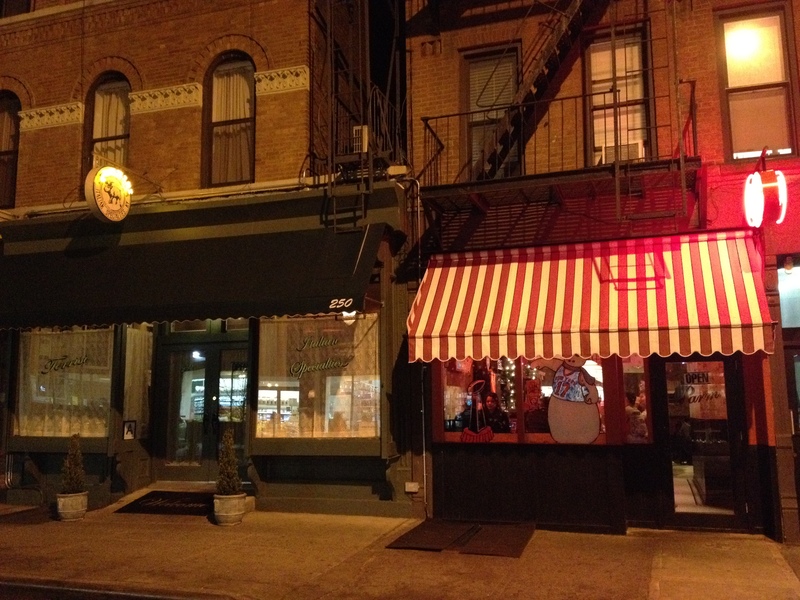 Two to Torrisi for the service, atmosphere, antipasti, and pastries. 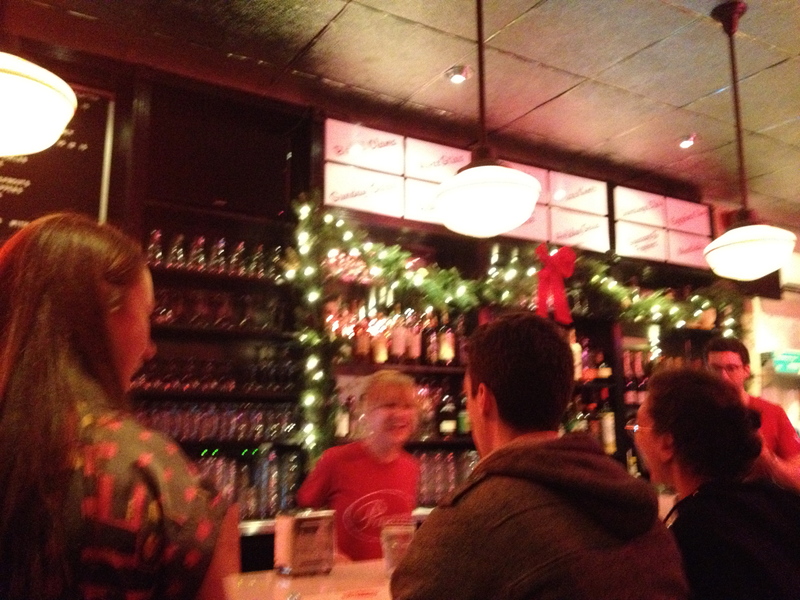 One to Parm for the tasty eggplant, cauliflower, Brussels sprouts, garlic bread, and friendly hostess. Tell your nonna, Little Italy is back. 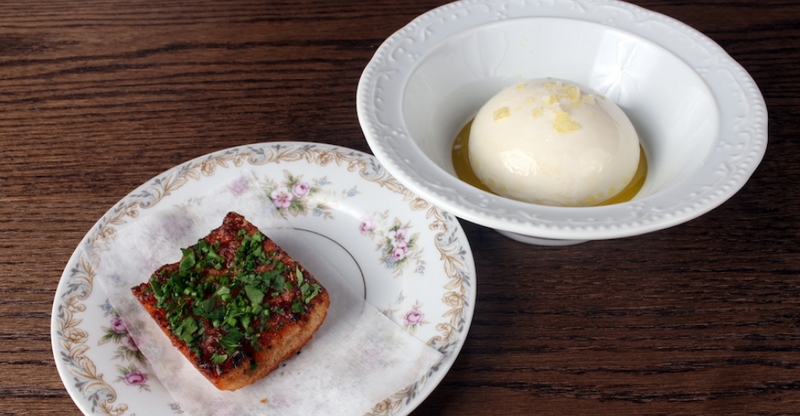 I had to cheat and use this photo below from the Torrisi website, so I could show you two of my favorite dishes, the mozzarella and the garlic bread, since my shots came out too dark. Buon appetito! my shirt is soaked with drool, thank you. ha! well, the pleasure is all mine.